In Dr. Sheri Adams church history class at Gardner-Webb University Divinity School, I learned, among other things, about Archbishop Oscar Romero. I found his life fascinating and have since been drawn to his legacy. Frequently, I refer to Romero's life and work when preparing sermons. Such was the case for this message, preached at First Baptist Church of Weaverville on May 15, 2016 (Pentecost Year C for those following the Revised Common Lectionary. Note: I substituted the Haggai text for the Old Testament reading). Here's the beginning of the message; it's continued in the attached audio. A word of explanation: this particular Sunday, when I did the children's sermon, a toddler was particularly interested in the microphone. He added a lot of commentary and a touch of chaos to the worship that morning. I refer to this at the beginning of the audio. 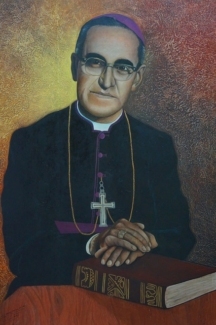 In May 2015, Pope Francis ordered the beatification of Oscar Romero, Archbishop of El Salvador. Pope Francis was affirming what many had said for decades: Oscar Romero’s life so closely resembled the life of Christ, that Romero should be declared a Saint. Romero came from a lower middle class El Salvadorian background. One of eight children, Romero learned a trade early because his father and others of the time believed that academic studies would not lead to profitable employment. Romero excelled academically though and by 13 he was longing to study scripture with the intent of becoming a priest. He completed his studies and was ordained into the priesthood at the age of 24. He rose quickly in the Catholic church and soon became the archbishop, the highest ranking priest in the nation. At the time, El Salvador was in the midst of a bloody civil war that essentially pitted the powerful elite—who were aligned with the catholic church—against the poor, oppressed majority. Romero, most people believed, would further the cause of the wealthy elite because he had such a position of power; in reality though, he became focused on the concerns of the poor. He spoke out against injustice, taking his message from the pulpit to the streets and to the airways. Romero, a true voice for those who had no voice, advocated for the poor literally until his dying breath, as he was assassinated while he was preaching a sermon on living out the message of Christ to serve the least of these among us. Romero, now considered by many to be a saint, was at the very least, a true advocate for the oppressed in his land. Oscar Romero, guided by the spirit, was the people’s advocate, the voice for the voiceless. The word Advocate comes from a Latin word which means “to call.” Our word voice comes from the same Latin root word. Advocate, therefore, could mean "to call" or "to give voice to." . . .